Today, we’ll meet with Doosan Heavy Industries & Construction, which has won a series of domestic and international orders for its energy storage system, or ESS. Let’s hear from the vice president of the company, Kim Sung-won. In May, we signed a contract with SK E&S, which is a Korean gas and power company, to supply 70 megawatt per-hour capacity ESS equipment for electric power demand management. Separately, our U.S. subsidiary, Doosan GridTech has been working with U.S. utility company Austin Energy since 2016 to supply ESS integrated solutions. It has recently been selected as the most notable project of the year by GreenTech media, a leading U.S. media outlet for renewable energy. Last year, the company received an order from the Los Angeles Department of Water and Power to offer a 20 billion won ESS to the Beacon Solar Plant near the Mojave Desert. In April this year, it has also won a contract from Consumers Energy to provide an ESS at a substation in southwest Michigan. An ESS allows power plants to store energy when demand is low and use or transmit the stored energy later when needed. When generating new renewable energy by using solar or wind power, the system can also remedy its shortcomings. Thanks to these benefits, the global ESS market is forecast to grow from two-point-nine billion US dollars in 2016 to 34-point-seven billion dollars in 2025. It is considered the blue ocean in the energy industry, where Doosan Heavy Industries & Construction has won several orders in succession. Mr. Kim tells us why the South Korean industrial firm is drawing so much attention. ESS is emerging as a new business in line with the distribution of new renewable energy. It is still in the early stage, given technological development and market maturity. In this fledgling stage, a close relationship between customers and reliable solution providers is the biggest factor behind success. As South Korea’s leading power plant equipment maker, Doosan Heavy Industries & Construction has grown with our customers both in Korea and abroad for the last 60 years, providing traditional thermal- and nuclear power-related facilities. Recently, we’re focusing on new renewable energy sources, including wind power and the integrated gasification combined cycle. We’re confident that we can understand our customers, namely, utility firms, better than anyone else. That’s why they show great interest in our energy storage systems. The company was founded in 1962. 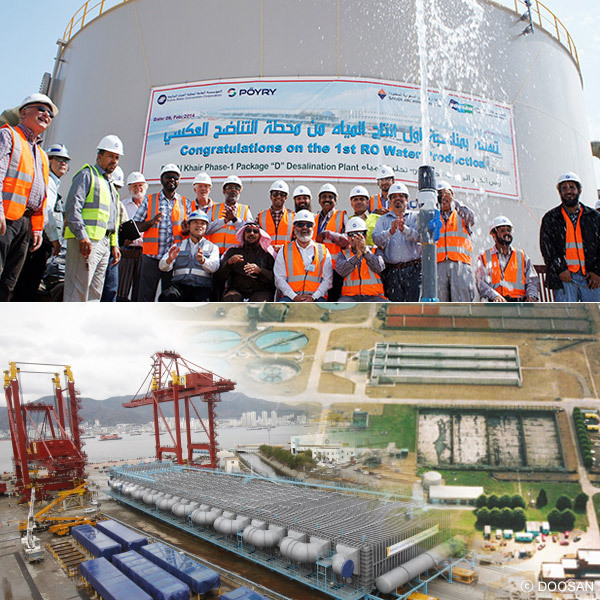 It is one of the leading providers of power plant equipment and seawater desalination solutions, in particular. Known for its advanced technology, the firm is the top performer in the global seawater desalination market, with a share of 40 percent. 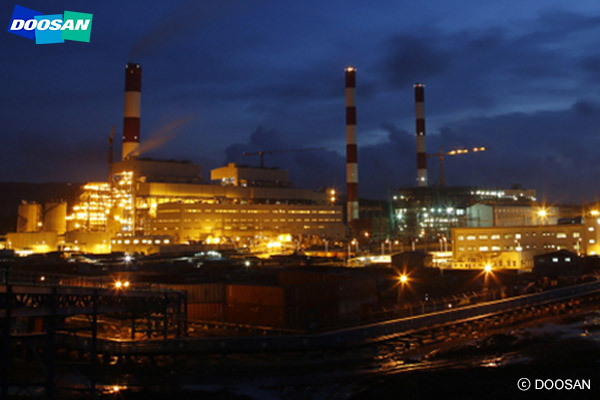 In the power plant sector, the company has taken part in all major projects in Korea since the 1970s. Starting with Younggwang Nuclear Power Plant 1 and 2 in 1976, the company has accumulated its own expertise to develop nuclear reactor technology independently. As a result, it re-exported nuclear power plant equipment to the U.S. in 1999. It signed a deal in 2010 to provide a nuclear reactor to the United Arab Emirates. The Korean power plant equipment manufacturer has been leading the world market based on its technology of designing, constructing and test-operating relevant facilities. It is aggressively exploring the area of energy storage systems as well. Here again is Mr. Kim. Humans have depended on carbon energy based on petroleum since the Industrial Revolution, but the era is coming to an end due to environmental problems. I do believe that we’ll bring in a new era of new renewable energy. But the generation of this type of energy is rather unstable. For example, winds may or may not blow, and there is a big gap between the day and the night when it comes to the production of solar energy. In order to supply energy in a stable manner, even when there’s no wind or at night, ESS solutions are essential, as they enable people to store energy and use it later. Our company has long been dedicated to power plant equipment, and it has now turned its eyes to the ESS business to take up a new challenge and keep up with the latest trends so we can become an industry leader. The company has been preparing for the future, carefully reading the change in the energy industry. 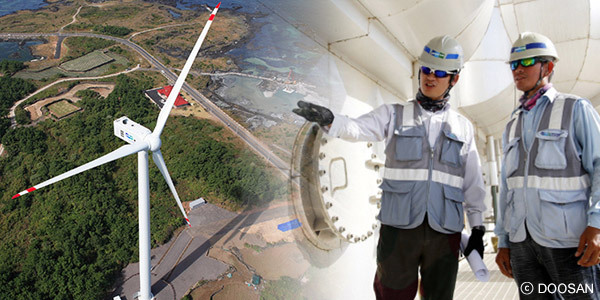 It started the wind power business in 2006 and finished developing three-megawatt offshore wind turbines for the first time in Asia in 2009. In 2011, it signed a contract to construct Korea’s first integrated gasification combined cycle demonstration power plant. And it began to develop ESS in earnest in 2015. In September that year, it was selected as the main ESS solutions provider for a smart grid project implemented by the Korean government. It acquired American ESS software solutions provider, 1 Energy Systems, in 2016, to lay the groundwork for designing, installing and test-running ESS solutions. Since then, the company has showcased its competitive edge in overseas markets. Mr. Kim says that the company invests a lot in technological development. What matters the most is technology. We have put top priority on technology from the beginning, even acquiring an American company to develop technology more effectively. Seventy percent of the ESS personnel in our company, including Doosan GridTech, are technical staff. And most of the technical personnel are software specialists. We need competent software designers and engineers in order to exactly figure out what utility firms need and provide ESS solutions tailored for them. We’ll continue to invest in this area.